Fourteen players took part in the Open category of the first Perth International Open in Scotland on Saturday 14th June. Twelve players from local clubs Glasgow and Tayside were delighted to be joined by Colin Tarry, who made the trip up from London. A special guest, Subbuteo legend Mike Dent, also receives major plaudits for playing the day after his wedding in Edinburgh! Mike, originally from the local area, now lives in Malaysia and helps to promote the game there as coach with his club, Hartamas Tigers. 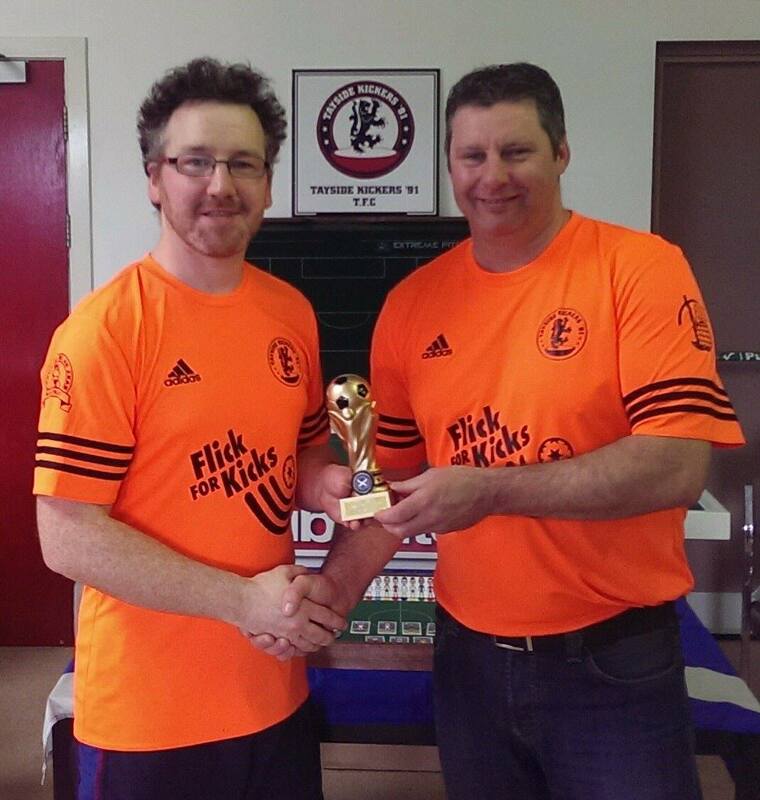 The tournament was played in great spirits and in a relaxed sporting manner, with some tense close games. In typical style, Steve Bennett, Scottish champion (1st seed), cruised to the semi-finals scoring 20 goals in 4 games to win his group. Tom Burns, second in the group also made the last four by going on to defeat Scott Fleming from Tayside, who clinched his group with a closely fought 3-2 win over 3rd seed Colin Tarry. Greg Dand progressed on ‘Goals Scored’ over teammate Gareth Christie (2nd seed) after a 0-0 draw between the pair in the remaining group. Bennett and Christie also played out a thrilling 0-0 draw in the semi’s; Christie winning with a well-taken golden goal. Dand, competing in his first FISTF tournament for many years, was 1-0 winner in a close match against Burns. In the final, Christie had the perfect start, winning the ball then scoring a precise looping shot to the back post, on his first possession. However, this was quickly cancelled out by Dand with a fine strike at the other end. There was little between the two players, but half way through the second-half, Christie opened Dand’s defence then scored with a long range shot into the corner for 2-1. Christie continues his run of Scottish IO successes with four wins in the last three seasons. The team event on Sunday 15th was a low-key affair with just nine players available making up three teams, two from Tayside and one from Glasgow. However, there were some great games including David Baxter (Tayside B) leading twice against Christie (Tayside A) which ended in a 2-2 draw. New player Andy Beskaby (Tayside B) upset the experienced Tom Burns (Glasgow) with a 2-1 victory, which helped clinch second place overall for his team. 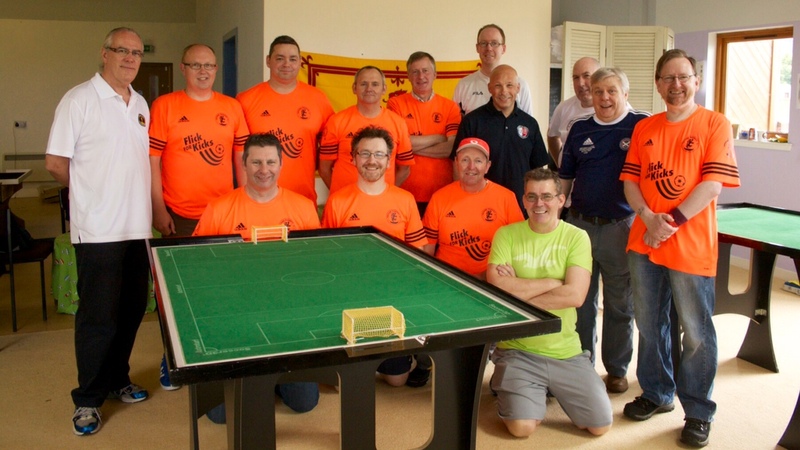 One more thing… The Scottish Table Football Association would like to wish newlyweds Mike and Tray all the very best for the future. This entry was posted in FISTF News and tagged Results, Scotland. Bookmark the permalink.